After the smashing success of some promotional Team Fortress 2 videos, we thought it was time to 'meet the movie-makers' at Valve and see how far this thing is going to go. Valve Software's fans have long had a basic demand: make great games. But these days, the Meet the Team animated shorts released since the launch of Team Fortress 2 and showcasing seven, so far, of the game's nine characters, have fans asking for something else: Dear Valve, please make movies. "The number of people at this point who want us going off and making full length movies and that sort of stuff has got to a point where it's hard to ignore," an under-the-weather Team Fortress 2 designer Robin Walker said during a conference call interview with Kotaku late last week. Yes, it's come to dreams of movie-making for the seemingly can't-fail studio behind beloved gaming hits such as Team Fortress 2, Half-Life, Portal and Left 4 Dead. "We're not ready to announce anything along those lines, but I don't think there's a person in this company that wouldn't love to see a full-length TF movie or even a 10-minute movie," Valve writer and TF2 video contributor Erik Wolpaw said. He was on the call with Kotaku from the Valve's office in Bellevue, Washington. "I'm not just being cagey. I'm a little bit removed from these kinds of things. But they keep giving us a little bit more rope with which to hang ourselves, so who knows." Feature films might be a flight of fancy for now, but to even joke about such things shows how far Valve has come in the two years since the studio released Meet the Heavy, the first of what have been seven increasingly elaborate shorts. The movies are so popular that even fake fan-made ones like an amateur take on the eventual Meet the Medic short has garnered 800,000 views on YouTube. The shorts have added character and flair to a multiplayer shooter that could well have had far less background and texture. The clips have their origins as audition scripts for the voice actors who played the likes of the Heavy, the Sniper and the rest of the characters in the game. The first video in the series, May 2007's Meet The Heavy, is almost word-for-word what Valve used to cast its actor. That Heavy video was made on the heels of a Portal video used to promote the personality of that game. Walker remembered his team's headiness with that the Heavy video, thinking it "was the greatest thing we had ever seen." The videos proved not just fun for fans but influential for the designers. "It helped everyone on the team get a little bit more in tune with who that particular character was, so we just kept knocking them out and they kept on being popular," Wolpaw said. As an example of how the videos influenced the design, Walker said that the Heavy's first upgrade, his health-empowering sandwich "came almost directly out of the movie… We felt the movie had justified and created a way for us to have a 'sandvich' in the game and have that action [of eating it] make any kind of sense in our game world." Jarate, the martial art of Team Fortress 2 involving thrown jars of urine, also was birthed outside the game, a little through the Sniper's movie and a Valve comic strip. Walker said that its introduction to fans through those non-game projects set up a perfectly understandable context for his game design team to introduce a gameplay element they desired, a "short-range enemy de-buff." No need to invent something new for that. Jarate was already in the fiction and ready to be implemented. Walker sees this as one creative end of Valve helping build the work of the other. "It's the natural result of having other creative folks messing around in the same sandbox. It's really hard not to see what they come up with and want to use it." The videos also helped the game's technology. Valve used Meet the Heavy to test the facial animation system the studio was developing for TF2. According to Walker, the new system "allowed our characters to have a much greater range of expressions than we were able to do in Half-Life… We wanted a test case for that." Ultimately, what they got to work in the Meet the Team videos is what would display for players running the game itself at its highest settings. Walker recalled that team's pleasure about "the expression on the Heavy at the end when he's shooting and screaming." It was no fake. "It wasn't this thing that the coolest bit in [the movie] was something that would happen in the game." As they videos have progressed they've drifted from their audition script source material. The newest one, Meet The Spy, uses none of such scripts. "We try be a little more ambitious with each one leading up to Meet the Spy, which was definitely the most ambitious," Wolpaw said. The popularity of the Meet the Team videos suggests that a strategy of supporting a game with post-release videos would benefit other games. Walker said it would only make sense if it was part of a solid business plan. "If we were just doing these movies for Half Life 2 two years after making the game it wouldn't make a lot of sense," he said. "It would be hard for us to justify the cost of producing them. When we tie it to the strategy we have with TF2 of continually updating the service ... it makes a lot more sense." What the videos do, he noted, is give ways for people who don't even have Team Fortress 2 yet to get some entertainment from the game. And that may turn them into TF2 players and customers. In addition to the Medic and Pyro videos, Valve is also expected to tap its team involved in the shorts to create a Team Fortress 2 comic. Valve co-founder Gabe Newell announced that plan in February during his keynote of the DICE gaming summit, but those on the call with Kotaku said they were not ready to announce further plans yet. 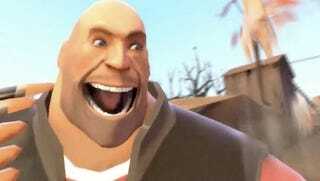 As for when the Medic and Pyro videos are coming out: stay tuned, is all Valve will say.